The supermarket isn't doing as badly as before, but it's not even close to doing well. Morrisons’ latest results are out and are far from being appetising. Its third quarter sales fell 6.3% on a like-for-like basis (taking out fuel), or 3.6% when new stores were factored in. That’s an improvement on the 7.4% slump in the previous six months, but hardly a reason to crack out the champagne (or the £5.50 Netto prosecco…). Back in March, the Bradford-based supermarket pledged to spend £1bn cutting prices over the next three years. Clearly that means sales taking something of a hit, but it doesn’t look like it has done all that much to reverse the tide of customers deserting for Aldi and Lidl. Chief exec Dalton Phillips (yet to go the way of Tesco’s Philip Clarke) also unveiled the Match & More loyalty card, which promises to match Aldi and Lidl’s prices or give customers points that can be converted into £5 store vouchers, to great fanfare last month. Predictably, the company said the card was ‘already proving extremely popular. Equally predictably, there were no numbers to prove that assertion. While Phillips has something of a strategy, something Tesco new boy Dave Lewis has yet to come up (or go public) with, industry watchers aren’t so sure it’s the right one. 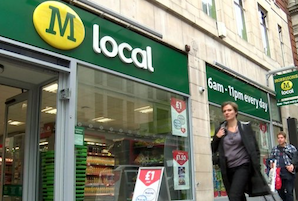 ‘This morning’s dismal set of numbers show Morrisons is still struggling to come up with a solution to the seemingly unstoppable rise of the hard discounters,’ said Planet Retail analyst David Gray. Strong words, but the big four supermarkets (Tesco, Morrisons, Asda and Sainsbury’s) aren’t exactly short of hard truths at the moment, as they battle the discounters while Waitrose sits contentedly at the top of the market. Ever-fickle, investors actually bought into Morrisons’ less-worse results, with shares rising as much as 8.7% to 176.5p, before heading back down towards 173p in mid-morning trading. Unless they know something we don’t, it’s hard to see them getting much value for money.